← First Fall Fishing Report is HOT With Many Species Feeding Aggressively In Cooler Conditions!!! Tarpon Springs, New Port Richey, Clearwater, fishing guide service Absolute Florida Flats Fishing is reporting great success on the inshore flats and the near shore flats, the Snook, Red fish and spotted Sea Trout are in migration mode, traveling and following the massive schools of the new returning live bait (pilchards) schools. All species have the feed bag on these little easy to dine on acre size (in some cases) bait pods, they just go crashing through them with there mouths open, this annual feed fest goes on until the pilchards thin out and go south for the winter around December. The pilchards are full of protein and the gamefish know this will help them get through a lean and cool winter. October is my favorite month of the year due to this phenomena, all on light spinning gear spooled with 8-15 lb. Spider Wire Ultra Cast braided microfiber, which allows us to stay off the pod’s of fish with long casts ! October is also the month the breeder size red-fish invade the shallow flats from offshore to spawn, these big bruisers with 4x wheel drive, after inhaling a bait leave a trail of boils as they make the light tackle elongated spooled fishing reels sing, fish can be from 27″ 9lb. to 40″ 20lb. This is also the time the Gator Trout (big trout) return to the skinny water also chasing the influx of bait while following the cooler water of fall o n the pristine flats with water turning gin clear. 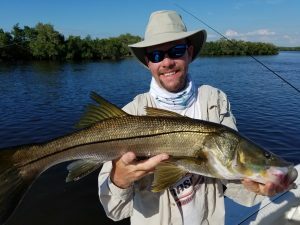 Snook fishing is also phenominal as these magnificent fish make a mad dash for estuaries and rivers in our west central Florida’s gulf coast region where they can sustain life by staying warm enough to avoid deadly hypothermia, eating every pilchard that comes in their sight and feeling through their distinctive black lateral lin e. Tight Lines, Let’s Go Fishing ! 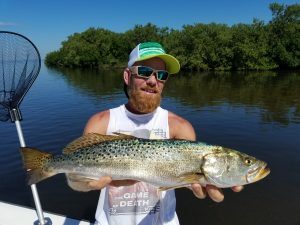 This entry was posted in Clearwater fishing guide, Clearwater flats fishing charter, Deep Sea Fishing Florida Ket's, flats fishing inshore fishing fishing charters fishing trip, Grat Spring Inshore Fishing, Gulf Coast Tarpon Fishing, Inshore Flats Fishing Charters, Nearshore fishing charter, Nearshore Grouper fishing, New ort richey fishing charters, New Port Richey fishing charter, New Port Richey Fishing guide, New Port Richey flats fishing charter, Offshore Fishing Florida, Offshore Trolling, Red-fish fishing charters, snook fishing charters, Snook Fishing Guide, Spotted Trout Fishing, Tampa Bay Fishing, Tampa Bay inshore fishing charter, Tampa Bay inshore flats fishing guide, Tamps Bay flats fishing, Tarpon Fishing Charters, Tarpon Fishing Fl. 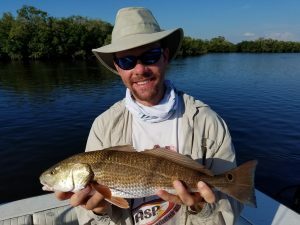 Gulf Coast, Tarpon Springs fishing Charter, tarpon springs fishing guide, Tarpon Springs Flats Fishing Charter, Uncategorized, West Cental Florida Gulf Coast inshore fishing, West Central Fl. 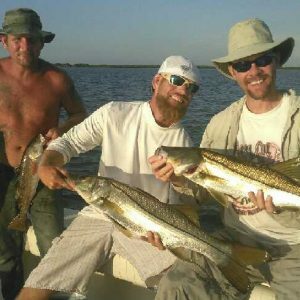 Fishing Charters, West Central Florida Tarpon Fishing, West Coast Fl. 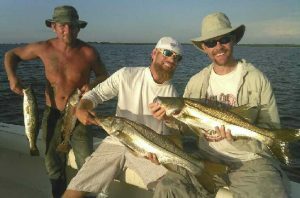 Trout Fishing and tagged backcountry fishing, boat charters, deep sea fishing, fishing charter, fishing guide, fishing trips, Fl.Gulf Coast Trout fishing, flats fishing, florida flats fishing, Grouper fishing charters, inshore fishing, inshore fishing charter, Inshore Flats fishing charter, Nearshore fishing charters, New Port Richey fishing charter, Offshore Trolling Florida, Red-fishing Charters, snook fishing charters, Spotted Trout fishing charter, Tarpon Springs fishing charter, Tarpon Springs Fishing Guide, Tarpon Springs Snook fishing, Trout fishing, West Central Fl. Gulf Coast Trout Fishing, West Central Florida Gulf Coast Guide Service. Bookmark the permalink.